C’mon, internet, show us yer owlbears! 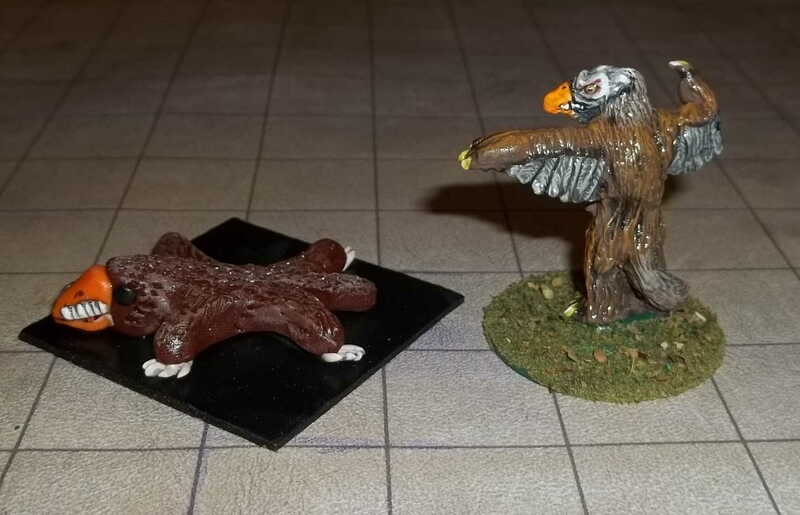 I decided to paint this Reaper owlbear I picked up really cheaply a year or two ago (it is from their “PB” line of retro lead/tin castings, so it was cheaper than the modern lead-free metal version, and moreover the FLGS had it 50% off!). I found some pictures of other people’s paint jobs which I used for ideas. 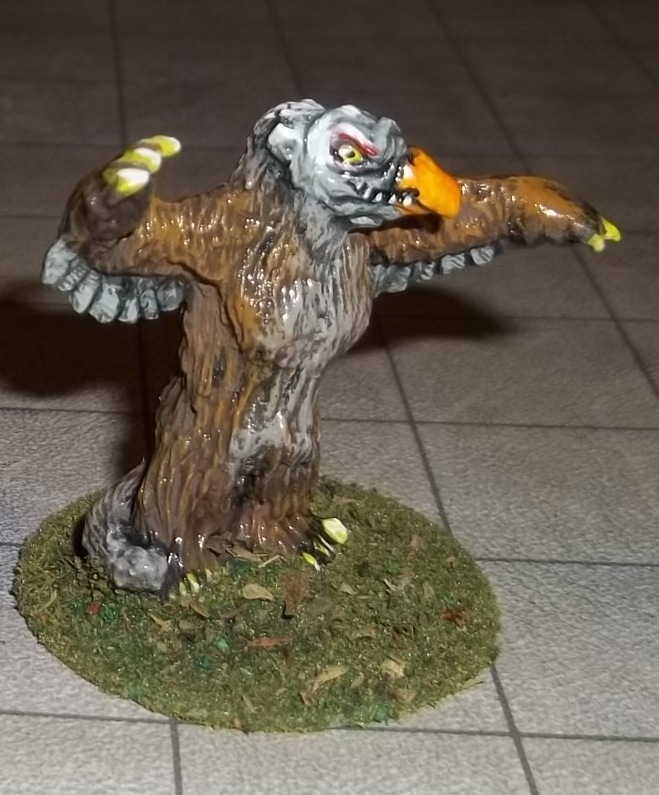 Once I was done with it, I thought I ‘d repaint my TSR owlbear. Back in the early 1980s, TSR, in a fit of hubris, decided to tank the AD&D license from Grenadier, give it to Citadel (though I never saw any Citadel AD&D minis anywhere in the US, maybe it was a UK-only deal? ), and finally in 1983-1984 they produced their own line of minis which were pretty uneven in terms of quality. I only had a few of these, including an owlbear that came in a blister with a rolly-polly polar bear. Anyway I looked, in vain, for a painted example of this guy and came up with nada. I did my best to make him match the Reaper owlbear’s colors and markings, though really he looks a bit more like a vultureracoon than an owlbear. Below, the Reaper owlbear, looking much more obviously owly and beary. Look at that glorious plumage! Even accounting for the puffed up plumage, the Reaper mini is a good deal bigger, so maybe these are a mated pair. In which case that weird Grenadier hawk-goat thing would be a an owlbear cublet. Sadly, owlbears are getting to be as rare as hen’s teeth due to the fad for owlbearskin rugs. My only regret is I forgot to put any feathers on the rug. Maybe I’ll touch up that some time. I did recall seeing a painted TSR owlbear in an ad once, in a Dragon magazine, and by chance I found it in the first issue I checked (#62). Not a bad paint job at all. I would like to point out that their painter noticed the racoonish features too and put bands on the tail. The rest of the ad has some of the character minis and you can see that the hand on the right has a spiked leather bracer. 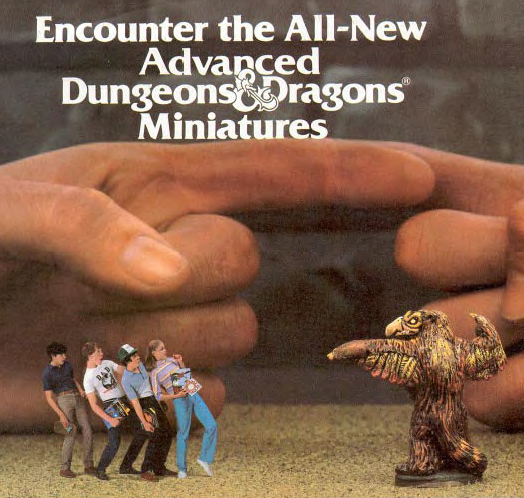 \m/ I guess TSR was feeling threatened by the Grenadier ads of the same period which featured a dude in full armor sitting at a table with their competing line of minis. 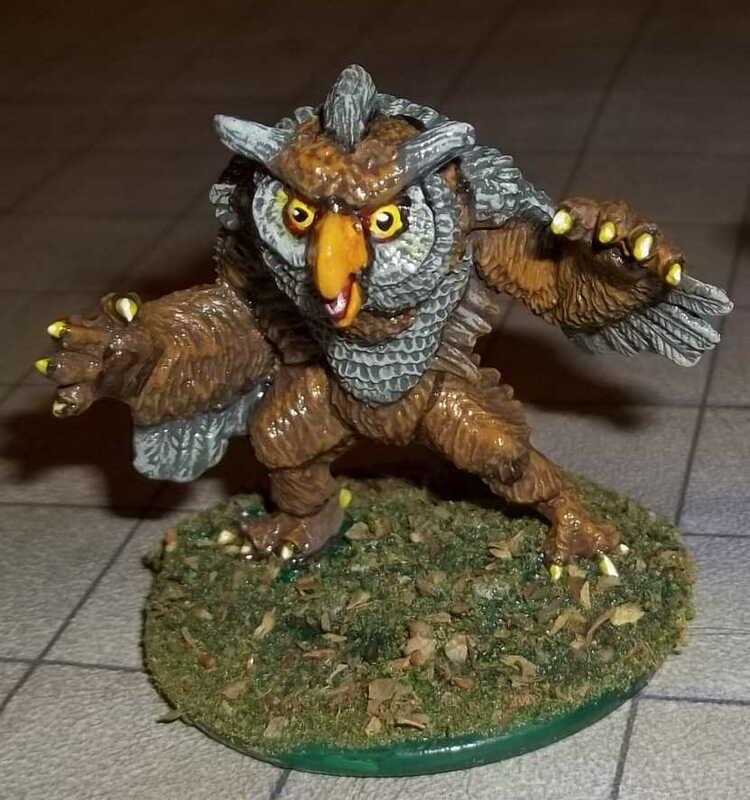 Do you, or did you, own any owlbear minis? Leave a comment and/or post a link if you’ve got something to show off. Or draw an owlbear. C’mon, internet, show us yer owlbears!!! Not my picture — mine are slopped with a bad paint job and glued to pennies because otherwise they just fall over onto their beaks. 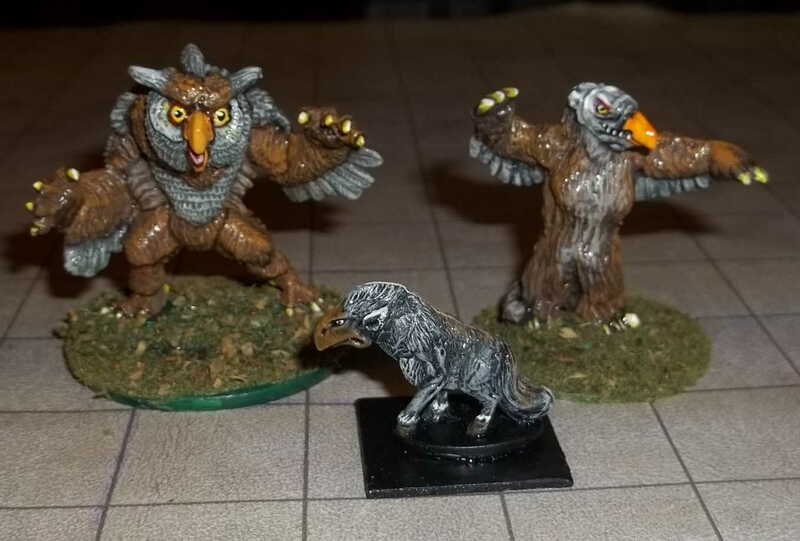 The minis fullfill the basic requirement (claws, beak, fur) but are a bit smaller than one would expect an owlbear to be. Sweet. Smallish & humanoid…kind of like the owlbear guard in that absolutely awesome-stupid Dragonstrike! video that came with the D&D board game back in the late 80s or early 90s. If I had some of those Heritage owlbears I would totally give them spears and helmets. Owl Bears are among my favorite D&D critters! I’ve got several different owl bear minis all painted up. I have the citadel, the Ral Partha version, the hackmaster great horned owl bear, and a grenadier or two tht I can think of right off hand. Would you like a photo of them? LOL! I’ve also got the Grenadier Monster Manuscript one in my collection, but as yet it is unpainted. I hope to pick up the Asgard Owlbear someday. http://www.miniatures-workshop.com/lostminiswiki/index.php?title=Image:Asgard-fmonsters-fm13.jpg I really like that one. I can’t paint but I do love a good owlbear steak – when its not trying to rip my face off that is. Nice owlbears! Indeed yes, I have quite a few owlbears. Most things I try (and fail) to collect only once (one encounter-group’s worth) but owlbears I’m making some small effort to collect as many as I can from as wide a field as possible. Not counting duplicates I have over a dozen varieties so far. Not that TSR one, though. He looks like a certain Jeff Easley painting was used as reference. 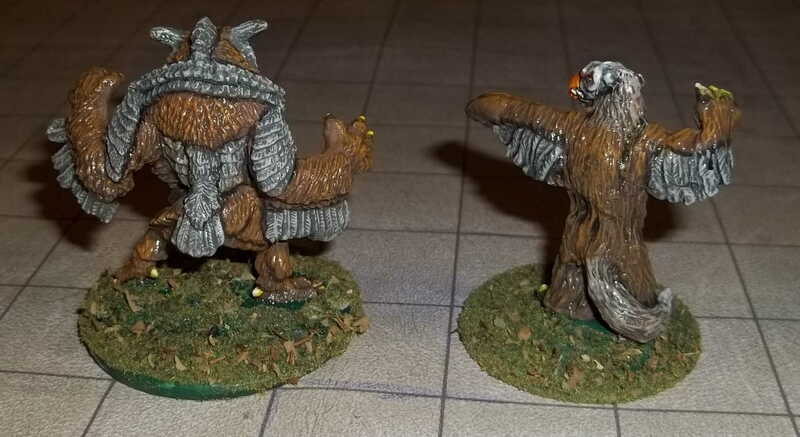 I’ve been intending to post up my own owlbear collection even though just one is painted so far. We’ll see next time I have the camera out. Can’t wait. I just checked and now see that the number appearing (in the 1e MM anyway) is 2-5! I always think of them as solo monsters, maybe because of the one in Keep on the Borderlands. 2-5, now you’re really looking at trouble!